William Penn founded the British colony in America named Pennsylvania and through his principles of government influenced the United States Constitution. Learn about the Lanape Indians. View the elm where the treaty was signed. The Indians gave Penn wampum. See a picture of this very belt. Find out what Pennsylvania means and how it got its name. King Charles II liked William Penn in spite of the fact that he was a Quaker. It is said that the King had owed Penn’s father a large amount of money, and that he decided to pay the debt in land. However this may be, in 1681 the King gave Penn a large tract of land lying west of the Delaware River. He and his descendants were to own it, just as the Calvert family owned Maryland. It is said that the King himself chose the name Pennsylvania, which means Penn’s Forest. William Penn gave a great deal of thought to the sort of colonists he wanted. Many English Quakers came, as well as Scotch, Irish and Welsh, but Penn especially encouraged farmers and craftsmen from the Rhine Valley, Switzerland and Sweden. Many people poured into the colony, which did not suffer the terrible hardships that most of the earlier colonies had endured. This was because Penn managed the colonization so well. He made friends with the Indians, he encouraged the more useful kind of settlers, and he made wise laws for the colony. The laws that Penn made were very liberal. No one was to be troubled for any matter of religion, the punishments for crime were not so harsh as they were in New England or Virginia, and men could get land on easy terms. In 1683, the city of Philadelphia, which means Brotherly Love, was laid out, and soon grew to be a handsome town with broad streets and brick houses. From the Independence Hall Association. A timeline of major events from the Independence Hall Association. 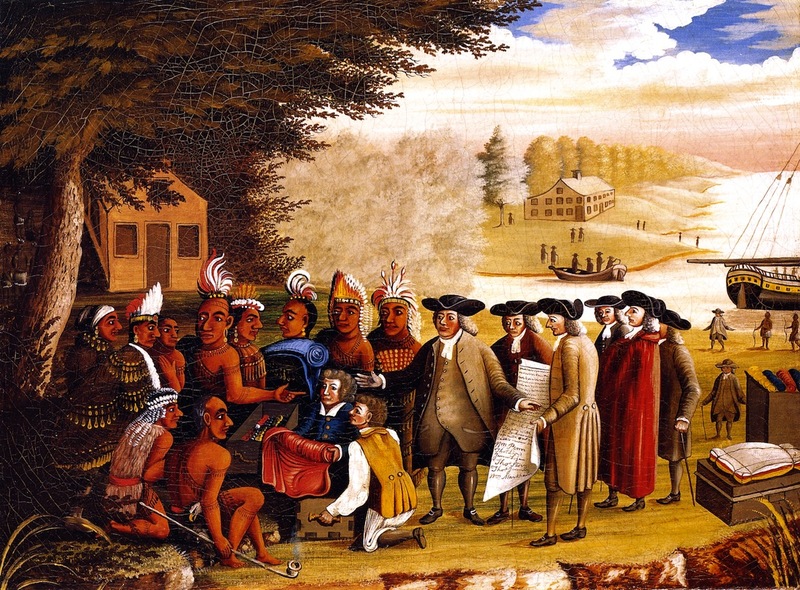 Background on the letters Penn wrote the Indians and the elm tree where the Great Treaty was supposedly made from the State Museum of Pennsylvania. Background information about the designation and the wampum belt from the State Museum of Pennsylvania. Biography from the Pennsylvania Historical & Museum Commission. Primary source document containing Penn’s laws. Brief history for young people with a focus on the clothing. View the painting by Edward Hicks. Another in his excellent series of historical fiction titles based on facts and written for children. Told from the point of view of a 12-year-old Quaker boy who travels with his family from England to settle in Pennsylvania. Free public domain work. A highly regarded title in the Heroes of History series. A correlating William Penn Unit Study Curriculum Guide is also available. Public domain biography in the True Stories of Great Americans series. Chapter from This Country of Ours by H.E. Marshall. Lesson plan for older students from the National Endowment for the Humanities that looks at primary source documents to explain the methods Penn used to attract settlers, his success in that effort, and the resulting success of the colony. At EduPlace.com for locating Pennsylvania. Map at NationalMap.gov for notebook, helpful for locating Philadelphia and the Delaware River.